Rabbit Health Section – What is Blowfly Strike? When a fly lays its eggs on a rabbit, the eggs hatch and the maggots start to eat away at the animal’s skin. This is called “Strike.” In the UK, the fly species involved are the blowflies, or blue-bottles and green-bottles to you and me. Blowfly strike is extremely serious. 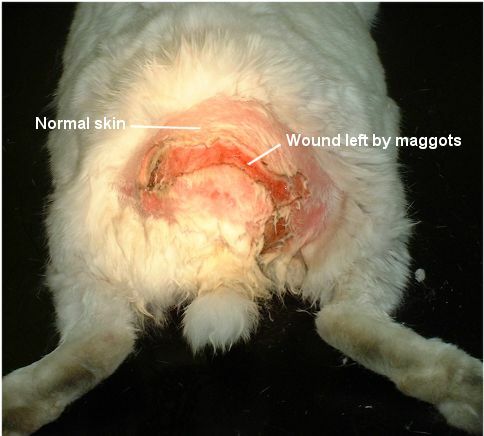 Affected rabbits suffer great pain and distress while the maggots eat away at them. Untreated they die within a few days. The few that are taken to the vet in time are usually very depressed, close to death. It is truly horrific. The first thing is to remove the maggots. This is a time consuming process, and involves physically picking the maggots off the rabbit. Then, the rabbit is treated for shock, and given pain relief and antibiotics. Sometime after it may be appropriate to surgically repair some of the wounds that the maggots have made. This requires a general anaesthetic, which involves considerable risk to a sick rabbit. It is often necessary to wait a day or two for the rabbit’s condition to improve before operating. The picture of a rabbit that suffered from blowfly strike, but was discovered fairly quickly. The wounds on this rabbit, while they are big for a rabbit, are much smaller than is commonly the case. This rabbit has been cleaned up, and is about to undergo surgery to repair the wounds. Why Do Flies Attack Rabbits? 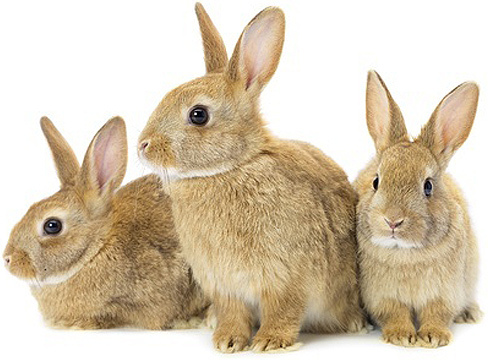 In the UK most rabbits live outdoors in hutches. Mostly these are cleaned out once, maybe two or three times a week. But rabbits produce faeces many times a day, and occasionally these faeces stick to the fur around the rabbit’s bottom. Flies are attracted to the rabbit’s hutch by the smell of the faeces, and especially areas of skin that have been soiled with faeces or urine. There they lay their eggs on the rabbit, the eggs hatch, and the maggots immediately start eating the rabbit’s skin. What Can You Do to Protect Your Rabbit? Basic hygiene is very important. Clean the hutch out every day. Make sure your rabbit’s bottom is dry and has no faeces sticking to it. Apply Rearguard® to your rabbit. Rearguard® works by stopping the development of maggots after they hatch. When a maggot hatches from its egg, it is not capable of doing much harm. However, it quickly moults, into a much more dangerous and aggressive form. Rearguard® stops this development into a dangerous form, and the maggot dies. Rearguard® is an excellent product. It’s designed specifically for preventing maggot attack. It comes in 25ml bottles, which is enough to treat one rabbit. One application will last for 10 weeks. But if your rabbit is very dirty, and you have to wash it regularly, it should be re-applied more frequently. It’s your rabbit’s best defence against this distressing condition.